Watch what happens when CNN and John King edit and take Marks constitutionally sound argument about the National Emergencies Act and separation of powers out of context. And you don’t need a Facebook account to watch. Total lack of surprise. 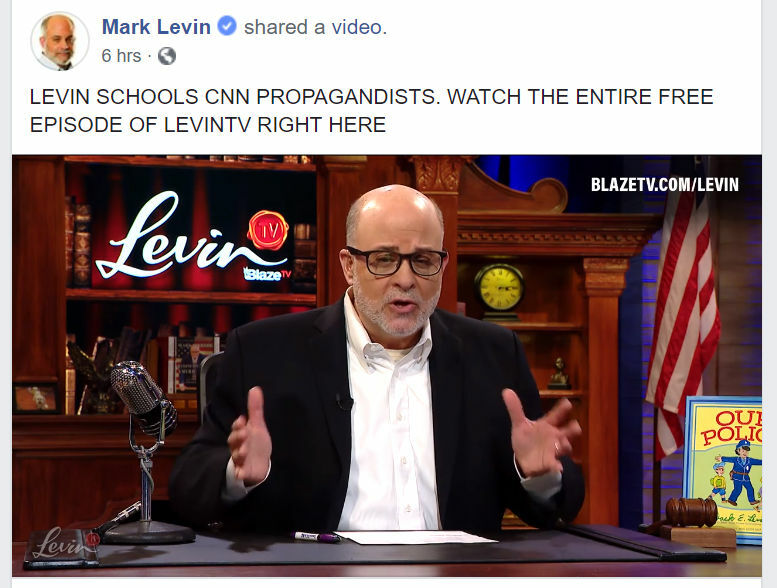 Levin knows something about the Constitution and his show is very informative, of course the libs are going to try to burn him. Tell you what, I’m from Utah and I’ve really soured on Mike Lee. He was doing a lot of Trump-bashing during election 2016. I haven’t forgotten and as far as I’m concerned, he still has a lot to answer for. This has the fingerprints of Romney all over it. I think it is him showing Trump there could be the votes for impeachment. I think Romney is making friends his first year in Congress. Especially his bestie from Utah. Romney is a total snake. Thank you, conservative98 for posting this. Mark Levin is right on! No time for Shapiro - as I’ve heard, he is “purportedly” a Never-Trumper type. I rate Bill Whittle and Mark Levin up there above everyone else. I admire the way Ben Shapiro debates and schools Leftists when he is on stage or in a panel discussion (he is nearly unparalleled in that respect) but I can’t listen to his show. He goes out of his way trying to prove he isn’t one of “those” conservatives. He does give a little nervous laugh at 1m32s, though, so perhaps he doesn’t believe what he is saying. Yesterday, I heard Levin on the radio putting forth a rock-solid defense Trump on this issue. During a commercial, I switched to Ben Shapiro and was quite chagrined to hear him taking Nancy Pelosi’s side. If you refuse to use Facebook (like I do) here it is on youtube. I hadn’t heard Ben Shapiro until about 2 weeks ago on the radio, he is good. Having lived in Utah for the last 20 years, I agree. Senator-for-life Hatch is another one. We did right when skeletor (Sen. Bennett, “Baghdad Bob”) got primaried, it should’ve happened to Hatch. I’m disappointed that that corndog was allowed to retire after infecting congress for 35 years, we should’ve ran him sometime around 1991.